D’Angelo Russell has a chip on his shoulder. The Los Angeles Lakers point guard was nowhere near satisfied with his performance during his rookie campaign and is determined to prove his worth. D’Angelo Russell has a chip on his shoulder. 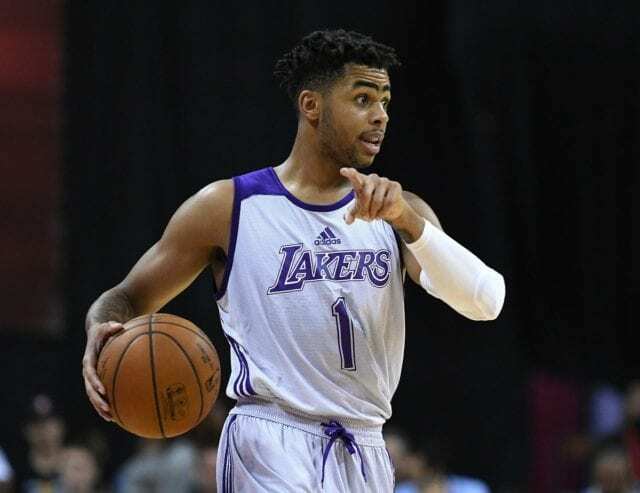 The Los Angeles Lakers point guard was nowhere near satisfied with his performance during his rookie campaign and is determined to prove his worth. No player on the Lakers’ Summer League squad was more motivated to make an impression in Las Vegas than Russell, and so far he’s far exceeded expectations. Apparently, Lakers strength and conditioning coach, Tim DiFrancesco, may have seen this coming. DiFrancesco recently spoke about Russell’s impressive work ethic and determination in an interview with Lakers reporter Joey Ramirez. Although Russell showed flashes of his talent this past season, the Ohio State product clearly needed some polish in many different areas. Russell wants to use his size to his advantage against smaller guards at his position and has already shown improvement in that area over the course of the first three Summer League games. Russell has imposed his will during Summer League thus far leading the Lakers to three straight victories and a first-round bye in the playoffs. The 20-year-old guard will make a strong case for Summer League MVP if he can continue to dominate in Las Vegas. Despite some impressive scoring performances and an average of 22.7 points per game, Russell has struggled to limit his turnovers. So far, D’Angelo Russell has turned a lot of heads while lighting up the scoreboard, but there’s much more work to be done and he appears ready to take on the challenge.